(Ali Sina) Since Dr. Naik presented 22 out of many errors of the Bible, let me present a short list of many errors of the Quran for him (or anyone) who cares to respond. All we need to prove that the Quran is not from God is one error while even hundreds of errors in the Bible do not necessarily disqualify it as a message of God. Let me make a caveat that I do not believe any message is from God. I do not think God sends messages or intervenes in human affairs. I am simply taking the side of fairness. This list starts with the false claims made by Dr. Naik about the Quran. It then continues with another short list of absurdities that exist in the Quran. Verse 21:33 says the sun and the moon yasbahun. This means both of them navigate or rotate around the earth and not around their own axis as Dr. Naik has claimed. Verse 51:47 says the universe is vast and not “expanding”. Dr. Naik is wrong on that. The description of water cycle claimed by Muslims as miraculous is incomplete because the stage of evaporation is missing and what Muhammad has described has been common knowledge since man became homo sapience. Dr. Naik says verse: 86:11 talks “specifically about the capacity of heavens to return back rain” i.e. the stage of evaporation. This is clearly not so. This verse is about the return of the firmament (sun, moon, start) that happens every 24 hours. Dr. Naik says verse 21:30 talks about the Big Bang. I showed that this verse is actually about a pagan mythology. Dr. Naik said that Islam is for all mankind. I showed that in verses 6:92 and 42:7 Muhammad said that he had come for the people of Mecca and its surrounding and in verses 32:03 and 36:6 he said that he was sent to people other than those who had already received divine guidance. According to these verses Muslims must stop propagating their faith in the Christian West. 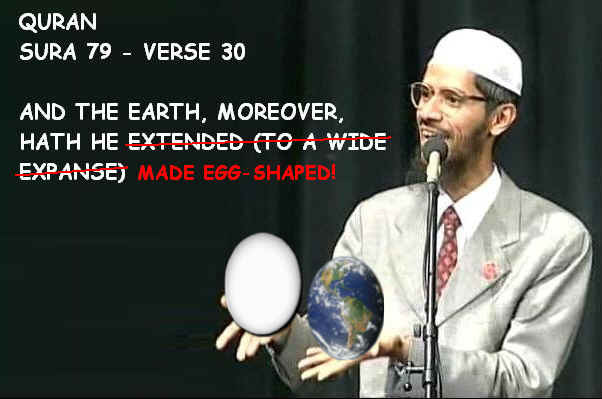 Dr. Naik claims that the Quran says ‘We have created the human beings from ‘the best part of a whole’. The truth is that the Quran says 32:8 human progeny is made of a ‘despised fluid’ (ma-in maheenin). Dr. Naik claims that no one knew that skin has pain sensors and everyone used to think that pain is sensed by brain. That is rubbish. The truth is the reverse. The function of brain in sensing pain is a recent discovery. Pain was felt where pain was applied. In the old days people thought the function of brain is to cool down the body like a radiator and heart is the thinking organ. The definition of embryology in the Quran 23:12-14 is wrong. Nutfa (sperm) does not become embryo (which in the Qur'an is erroneously called Alaqa, a congealed clot of blood). The role of the female egg in Quranic embryology is missing. And bones are not formed before the flesh. Just to mention two of several errors in these verses. 10.5, 25.61 and 71.16 say that both the Moon and the Sun are lamps “emitting light”. Dr. Naik simply lies when he says Nur is reflected light. Nur is direct light and Munir is an object that emits light not something that reflects light. 18:86 says… ‘Until, when he [Zulqarnain] reached the setting of the sun, he found it set in a spring of murky water’. Dr. Nail lies when he says this “appeared” to him. If it was only the appearance then such a thing can appear to anyone, anywhere; why mention Alexander? Alexander had become a legend and common folks believed that he had conquered the world from “one end to another”. Only he, who had been to both ends of the world, could have witnessed this amazing phenomenon of rising and setting the sun in murky waters. These are the waters/oceans that the ancient folk believed surround the dray land. 86.4 implies that stars are protectors of people. This is fairytale. 86.7 says sperms proceed from between the backbone and the ribs. This is wrong. 31:10 says “He set on the earth mountains standing firm, lest it should shake with you”. Mountains do not stop the earth from shaking with us. It is ludicrous to say if mountains were not there the earth would have shaken by people walking on it. 78:7 says mountains are like tent pegs or stakes. This is false. 78:6 says ‘Have We [1st person] not made the earth an expanse?’ and the verse 20.53 says "He [3rd person] Who has, made for you the earth like a carpet spread out”. 2:22 says the earth is a bed for you, and the heaven a roof. This is obviously wrong. Neither the earth is like a bed nor the skies are like roof. 16:66 says: “And most surely there is a lesson for you in the cattle; We give you to drink of what is in their bellies -- from betwixt the feces and the blood-- pure milk, easy and agreeable to swallow for those who drink.” This is rubbish. Milk is not produced from between feces and blood. This reveals Muhammad's ignorance of anatomy. 6:38, says that ‘There is not an animal on the earth, nor a being that flies on two wings, but forms communities like you’. No animal on earth forms communities like that of humans. 55:19-20 says there is a barrier between two waters “which is forbidden to transgress”. There is no barrier between any waters. All waters mix. .
Verses 7:54, 10:3, 11:7, and 25:59 say the universe was created in six days while verses 41:9-12 say it was created in eight days. Then again in 2:117 we are told that “He [3rd person] saith to it: 'Be,' and it is”. These are three different versions of creation – six days, eight days and instantaneously. At least two of them must be satanic verses. Which ones? 2:29 says “He [3rd person] created for you all that is in the earth. Then turned He to the heaven, and fashioned it as seven heavens”. This version of creation is anachronous. This is like saying first the child was born and then the mother. Is this another “miracle of Allah” or another blunder of Muhammad? The same error is found in 7:54, 10:3, 11:7, 25:59 and 41:9-12. 79:28-30 contradicts 2:29 and says “He raised its canopy (sky), then He created light and darkness “and after that He spread the earth”. 21:30 says “heavens and the earth were joined together (as one unit of creation), before We [1st person] clove them asunder?” But 41:11 says “Then He [3rd person] directed Himself to the heaven and it is a vapor, so He said to it and to the earth: Come both, willingly or unwillingly. They both said: We come willingly.” So were the heaven and earth joined originally and Allah separated them or where they separated and Allah joined them? There is a contradiction. One of them must be a satanic verse. Which one? 65.12 says "Allah is He Who created seven Firmaments and of the earth a similar number". This is false. Neither the sky nor the Earth are made of seven layers. The above verse also assumes that heaven and earth have wills of their own and can obey or disobey God's orders. This is good for children story but it is not science. The same verse is also anachronous. How can the creation of plants and animals have preceded the unification of heaven and earth? Dr. Naik astutely saw the error in the Bible that says the creation of the plants preceded the creation of the Sun. But he failed to see the exact same error in the Qur'an. If the Bible is wrong on this point, its copy i.e. the Qur'an is also wrong. 41:12 says “And We adorned the lower heaven with lights” This is a clear allusion to stars. Considering the Earth as the base, just as the Qur'an does, are stars in the lower layer of the sky while the Sun and the Moon and other planets of the solar system are above them? 22:47 and 32:5 say that Allah's day equal to 1,000 human years. But 70:4 says that it equal to 50,000 years. 13.2 says “Allah [3rd person] is He Who raised the heavens without any pillars that ye can see” and 31.10 repeats the same absurdity. 22:65 says “He [3rd person] withholds the sky from falling on the earth except by His leave.” Clearly Muhammad thought sky is a ceiling that can fall on earth and it is a miracles that it does not fall. 54:19 says Allah destroyed the people of Aad in a day. 41:16 says it was days (three or more) 69:7 specifies seven nights and eight days in succession? At least two of these versions must be satanic verses. At the Last Judgment, people are divided into three groups 56:7 or two groups 90:18-19, 99:6-8? Who takes the souls at death: The Angel of Death 32:11, THE angels (plural) 47:27 or Allah 39:42? How many angels announced the birth of Jesus to the Virgin Mary? One angel 19:17-21 or several angels 3:42-45? Who was the first Muslim? Muhammad 6:14,163, Moses 7:143, some Egyptians 26:51, Abraham 2:127-133, 3:67 or was it Adam 2:37? The food for the people in Hell will be only "Dhari" 88:6, only foul pus from the washing of wounds 69:36, or will they also get to eat from the tree of Zaqqum 37:62-66? 2:221 says “Do not marry unbelieving women (idolaters), until they believe”. 9:30 makes it clear that Jews and Christians are unbelievers, have deluded away and “Allah's [3rd person] curse be on them”. And yet 5:5 says it is lawful to marry women of the People of the Book. 9:17 and 9:69 say the good deeds of unbelievers will not be rewarded. Yet 99:7 promises “whoso doeth good an atom's weight will see it”. 2:62 promises rewards for Christians and Jews. But then again the Quran says they are blasphemers 5:17, 72-73, have deluded away from the truth, are unbelievers and curse of Allah be on them 9:30. Contradictory teachings: On wine and intoxicant drinks. a) “You obtain from them intoxication (sakaran) and goodly provision.” 16:67 = It is good. c) “They ask thee concerning wine (al-khamri) and gambling. Say: "In them is great sin, and some profit, for men; but the sin is greater than the profit." 2:219 = It can be both good and bad but it is more bad than good. d) “O ye who believe! Intoxicants (al-khamru) and gambling, (dedication of) stones, and (divination by) arrows, are an abomination,- of satan’s handwork: eschew such (abomination), that ye may prosper. 5:90-91=completely bad. Are all these verses from the same god? How come something that was first “a goodly provision” became an abomination and Satan’s handwork? I stop here. It is easy for me to show 1000 errors only in the Quran and thousands more ridiculous tales in the hadith. Remember what Dr. Naik said: All we need to prove it is not from God is one error. If he can't answer to all of them, it means the Quran is not a book of revelations. However, he won't even be able to answer to ONE of them.